In a landmark referendum on Sept. 18, the people of Scotland will vote Yes or No to determine the future of their 300-year-old union with England. The simplicity of the question and the answers are by no means indicative of the intensity of the debates and emotions in this campaign. There have been passionate debates over the years between the unionists and Scottish nationalists. The publicity of the campaigns has generated a lot of interest around the world. As a result, this week’s vote is being closely watched by Oromo activists and nationalists the world over who are still trapped in old empires. What lessons can be gleaned from the Scottish case for the decolonization of the Ethiopian empire and the Oromo people’s aspiration for an independent statehood? The Scottish people spent several hundreds of years fending off the English. This culminated in the Acts of Union in 1707 when the English and Scottish parliaments voted to create the United Kingdom. Scotland was in economic bankruptcy and it had no more energy left to resist another invasion and continued meddling by the English. Like the Scottish wars of independence, Oromos in Central, Southern and Eastern Oromia put up years of stiff resistance against Abyssinian occupation. In some ways, the acts of union also resembles the incorporation of Western Oromia into the Abyssinian empire. The beheading of William Wallace, a prominent Scottish hero, resonates well with cases of Oromo heroes who perished, amputated or mutilated at the battles of Gulale, Aanolee, Chalanqo and many others. Like the Scots, the Oromo were treated inhumanely by the invading Abyssinian feudal lords. For instance, the industrial revolution in England was fueled by wool supplied by absentee landlords who evicted Scottish highlanders from their lands to give way for large scale sheep rearing. Similarly, the Oromo experienced a grand scale dispossession under the Gabbar system, which appropriated virgin farmlands to feudal landowners. For the Scots, the greatest victim was their language, Gaelic, which suffered hugely in part due to the highland clearance and relocation of Scottish farming communities to faraway territories such as Nova Scotia in Canada. In contrast, Oromo farmers endured the brunt of exploitation toiling their own land for absentee landlords as serfs and slaves. This together with the demographic balance helped the survival of the Oromo language against all odds. To borrow an Orwellian expression, all empires are wicked but some are less wicked than others. With regard to the relative successes of the empires that absorbed them, the fate of Scotland and Oromia could not be more different. In Oromia’s case, it goes without saying that the Ethiopian empire failed to establish any degree of cohesion among its constituencies. The fact that a situation similar to the Scottish highland clearances is still happening in Oromia — nearly a century and a half later — is a testament to the farcical nature of the Ethiopian empire. By contrast, despite all the setbacks that came with losing independence, Scotland thrived in the UK, where the whole became greater than sum of the individual parts. For one, under the terms of the Acts of the Union, Scotland retained most of its institutions, e.g., legal system, education, church and etc. This helped energize the union. Success in domestic economy through a series of revolutions (e.g. agricultural and industrial) propelled the UK to emerge as one of the most powerful nations on earth, so much so that it came to be known as “the empire on which the sun never sets.” In effect, Scotland and England built solid institutions and sustained enviable democratic governance. The same can’t be said about Oromia. The Amharanization doctrine was essentially designed to wipe out all aspects Oromo socio-political, religious and cultural institutions and aggressively replace it by official state functions. 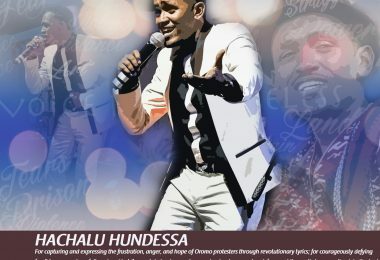 What can Oromos learn from the Scottish nationalists? There is no doubt that both Scotland and Oromia were victims of internal colonization. Both nations experienced brutal wars of conquest in the centuries leading up to and during their involuntary incorporation into burgeoning empires. 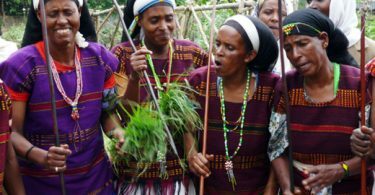 Both Scotland and Oromia maintain distinct culture and history from their neighbors. Thus, it is ironic that the Scottish nationalists did not anchor their case for independence on history. They have not campaigned on the principle of decolonization. Past history or injustices during wars of resistance did not play any part in the Scottish independence rhetoric during the referendum debate. In fact, most cases for Scottish independence dramatically contrast with Oromia’s circumstances. The Scots, who constitute about 8.4 percent of the UK’s population, are a minority group. This led to a phenomenon commonly referred to as democratic deficit, meaning political parties could form a government in the Westminster regardless of which way the Scottish people voted. For instance, for far too long, the Conservative Party have been governing the UK with no electoral mandate in Scotland. This is why the Scottish National Party (SNP) firmly anchored their argument on the principle that no matter how hard they try to perfect the union, democracy is unlikely to work in favor of the Scottish people so long as Scotland remained in the UK. Needless to say, in contrast to Scotland’s clear disadvantage, Oromia enjoys a massive demographic advantage. This means democracy will work exceptionally well for Oromos. Several attempts have been made to address Scotland’s democratic deficits through referendums for Scottish devolution. This culminated in the formation of the Scottish Parliament in Edinburgh in 1999. However, the devolution of the political power have not led to any meaningful economic power. For instance, the parliament had power to spend funds allocated to it from the Westminster but it had no power to raise its own revenues through taxes. This fuelled the rationale for independence advocated by the SNP who rested their economic case on the fact that the oil-rich Scotland is actually a net contributor to the UK treasury, by about 400 pounds per person. In Oromia’s case, it would be unfair to talk about the state’s share in government revenue in terms of some marginal net contribution; it suffices to say the bulk of Ethiopian government revenue from domestic sources is generated in Oromia. However, it should be noted that Scotland’s economic case for independence is rooted in the incurable democratic deficit, which in turn is explained by its demographic disadvantage. 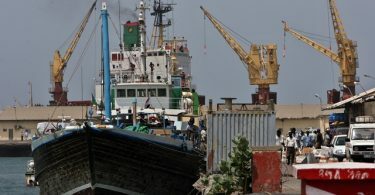 On the contrary, Oromia is not expected to encounter the Scottish economic dilemma provided that Oromos assert their power to establish a democratic and genuinely federal system of government. Scotland is located in the periphery of the UK. Peripheral locations often find themselves in disadvantageous positions because resources (human and financial) tend to move and concentrate in the center through forces of agglomeration. More and more jobs are created in London and its surroundings in England. The youth and the skilled among the Scottish people migrate to England in search of jobs. Similarly, investment resources follow suit through the banking system. It requires a good deal of government intervention to slow down this self-reinforcing cumulative process of resource outflow from the periphery to the center. The Scottish independence is essentially meant to reduce or stop the resource outflows by creating jobs in Scotland. 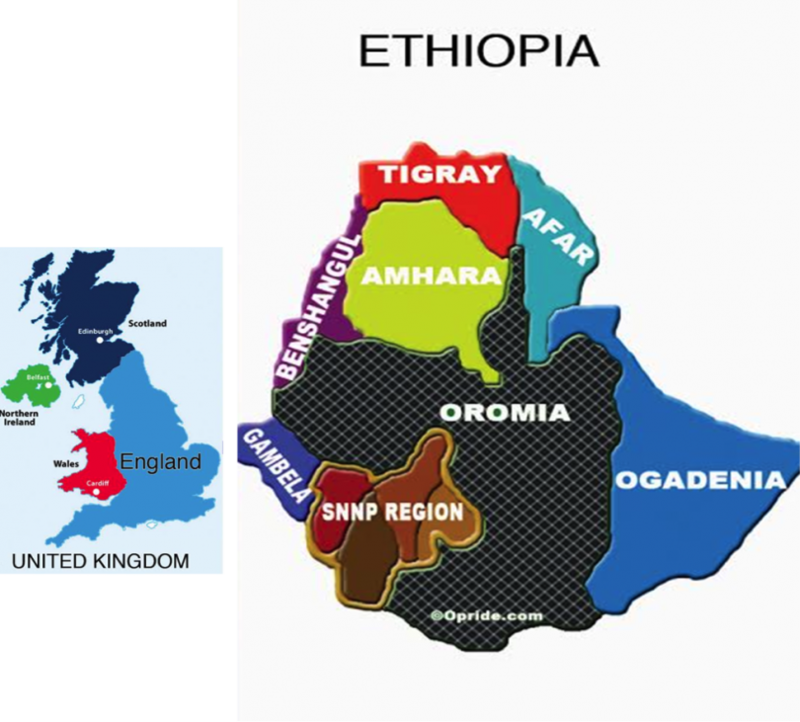 By contrast, Oromia occupies a vast landmass in Ethiopia, comparable more to England in the UK than Scotland. In fact, Oromia is already a magnet, a preferred destination for investors from domestic and international sources. Under normal circumstances, such resource inflows are considered a blessing. However, circumstances are not normal in Oromia so we see resources as a curse to our people. The main reason for this is that Oromos do not not participate in critical aspects decision-making (e.g., investor selection, business location, or employment contracts). The similarities and differences between Oromia and Scotland may enable us to shed some light on established contrasting viewpoints in Oromo nationalist rhetoric. From the foregoing discussion, it is clear that the SNP has mainly campaigned on democratic principles. In that sense, SNP’s strategy is consistent with the pro-democracy viewpoint in the Oromo movement. The former to justify departure from the UK empire and the latter to justify feasible and possible achievements of democracy within Ethiopia. While similar to the pro-independence camp in Oromia, the SNP chose not to invoke decolonization as a rallying cry. To be fair, colonial trappings are a thing of distant past within the boundaries of the UK. In contrast, archaic colonial behaviors and sentiments are still rife in the Ethiopian empire. This has made the road to freedom a lot more complicated for Oromos than the Scots, with clashes between contesting viewpoints. At this juncture, it is useful to draw attention to a few conceptual muddles that might have exacerbated the differences. One is related to the issue of “democratic principle” as discussed in the context of the Ethiopian empire. 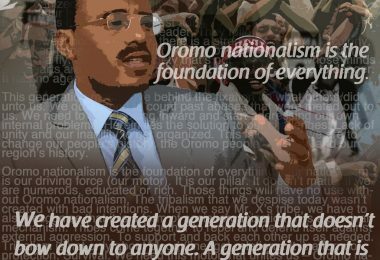 It should be clear that “democratic deficit” does not mean “lack of democracy.” Oromo nationalists often say, “the Ethiopian empire has been ruled by dictators who do not give democracy to the people.” This expression comes from a misconception that democracy is in fact “given.” The reality is democracy is never given, it is “earned” by establishing power balance through a resolute struggle. As such, it is not tenable to rest the case for Oromia’s independence on the supposition that democracy will not work in the Ethiopian empire. This amounts to resigning from endeavoring to establish power equilibrium through which democracy can come to existence. Similarly, we often hear assertions such as “an empire cannot be democratized.” The UK is the mother of all empires and yet it is one of the most democratic countries on earth. The English, who are the majority group in the UK, do not seem to have any trouble with UK’s democratic governance. But the minority Scots have expressed a legitimate grievance that UK’s democracy did not work for them. It is true that the English were colonizers in the context of the UK but then again we should note how they “achieved” democracy through Magna Carta long before they became colonizers. In a nutshell, Scotland’s potential independence offers little in a way of practical lessons for Oromia. Oromo nationalists should instead look at multi-ethnic states such as Malaysia and South Africa on how the majority can and should assert themselves to build democracy. If anything, Oromo leaders should emulate the SNP’s vision and style of effective leadership to mobilize and energize their base in order to realize the aspiration of Oromo people for freedom. * Ayele Gelan (PhD) is a research economist at the Kuwait Institute for Scientific Research (KISR). He can be reached for comment at augelana@gmail.com.